If there is a recipe that involves baking and even I can pull it off then you know it has to be easy! I love this one because not only do the loaves freeze really well for later, but it can be made as either a sweet or a savory treat. I’ve made a savory version but also included the alterations to make it a sweet one. As long as you keep the basic ration of wet to dry, put in whatever flavors you want. I think for my next one I’ll try apricots & pecans… The actual recipe is really pretty simple but takes quite a bit of time to finish because of the rising required. Trust me though, it’s definitely worth it! In a small bowl dissolve sugar in warm water. Once dissolved, add pkg of yeast and let sit for 10 minutes or until frothy. In a large bowl, mix flour & salt together and once blended, add in yeast mixture, honey, eggs & egg yoke (saving 1 whole egg for later) oil, garlic & rosemary. Knead together on a lightly floured surface until a smooth dough forms- about 10 minutes. Put dough ball in a greased bowl spinning it to grease all sides of dough, cover with plastic wrap and let it sit in a warm draft free area for 1 hour or until about double in size. 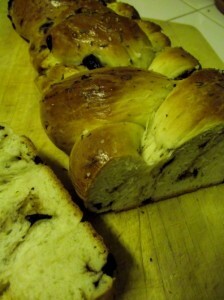 Punch down dough and knead in olives. Separate dough into 3 pieces and roll out each piece into long even ropes (about the length of elbow to fingertips) Join the 3 ropes together at the top and then braid, joining ends together at the bottom. Put it on your baking sheet, lightly cover it with plastic wrap and again let sit in a warm area for 1 hour or until approximately doubled in size. Preheat oven to 350. Beat remaining egg and brush over entire top of bread with a pastry brush. Sprinkle top with remaining rosemary & coarse salt and bake for 30-35 minutes. Let cool before cutting.